The five exercises below are more advanced than the previous five. Don't move on to them until you're certain you're comfortable with the previous five. If this is your second day of practice, I recommend you set up the 120 foot by 10 foot (35 meters by 3 meters) rectangle used in the Shifting and Braking exercise, and repeat that exercise a few times to refresh your skills at starting, shifting, and stopping. Then ride around the rectangle in tight ovals a few times to get used to turning again. Place five traffic cones about 25 feet (7.5 meters) apart. Ride around the cones going alternately to the right of one then the left of the next. When you're comfortable after a dozen circuits or so, move the cones together to 20 feet (6 meters) apart. After a dozen or so circuits like this, move the cones to 16 feet (5 meters), and practice on this. Leave the cones at 16 foot intervals, and move alternating cones 3 feet (1 meter) out to either side of the centerline. You'll find this practice a bit difficult. Keep at it until you're comfortable and competent. If you have to put a foot down to stabilize the bike, you lose a point. Place your traffic cones in a triangle with equal sides about 20 feet long. Ride around the triangle. Stay within three feet of the triangle at all times. Go around the triangle to the left, then to the right until you're comfortable. After a dozen or two circuits, change the shape of the triangle. You will learn in this exercise that when turning sharply, the rear tire cuts a track inside the front tire. When you turn tight circles or make sharp corners, the rear tire turns considerably sharper than the front tire. 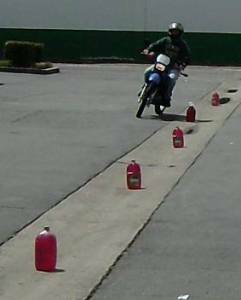 Because of this if your front tire barely misses a cone, your passenger foot peg or rear tire is likely to hit the cone. That's ok, that's why they're cheap and hard to break. This is a minor thing on motorcycles, but a really big deal on 18 wheel trucks. Place two traffic cones about 4 feet apart. Place another two traffic cones 10 feet further on and 30 feet apart. Now that you've been riding for a few hours, it's time to start working on your more advanced skills. Place two traffic cones about six feet (2 meters) apart. This is to mark a stopping line, like the limit line at an intersection. Ride towards the two cones in 2nd gear at 15-25 mph (25 - 40kph). Practice waiting until the last moment before hitting the brakes, then stopping so that your front wheel is exactly on the line made by the two cones. Do this until you're comfortable that you know how quickly you can stop. In this exercise, be certain to pull in the front brake lever gradually. If you just grab as quickly and as hard as you can, there's an excellent chance you'll lock up the front wheel. 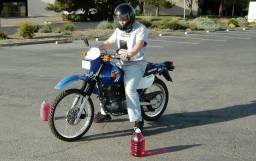 At this stage in your motorcycle learning, this will almost certainly make you fall down. An emergency stop. . . the squirrel would have lived! 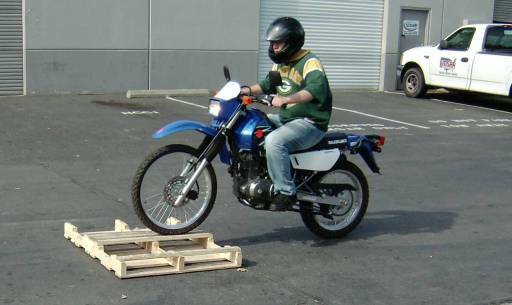 When riding a motorcycle on the roads, you will hit obstacles from time to time. It's good to practice this so that you don't go into complete brain lock the first time it happens to you in traffic. We need to find an appropriate obstacle. This depends on your bike. If you have a small street bike, a 2x4 is a good start. Later you can switch to a 4x4. If you have a dual sport or a dirt bike, the long travel suspension means you can use a larger obstacle. Richard has a dual sport, so as you see below, we're using a freight palette. Ride at the obstacle at 10-15 mph, and hit it square on. There's a leap of faith the first time you do this, but the bike will actually ride right over it without any trouble. Practice this until you can hit the obstacle calmly without fear or tension. As you ride over the obstacle, if you're free of tension your arms should flap a bit from the bump. If you have a dual sport or a dirt bike, you can get more creative with obstacles, riding up and down curbs, hitting pot holes on purpose, or whatever else you can find. Any dual sport or dirt bike can easily handle an abrupt drop of one to two feet (.3 - .6 meter) so long as you're going at least about 10 mph. You cannot ride up things like curbs that are more than about 8 inches (20cm) high. Anything higher than this requires that you pop a wheelie as you're approaching it. This is a somewhat advanced technique, not suitable for your first week of riding. 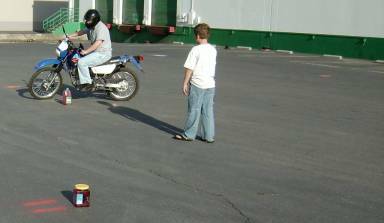 Below is Richard doing this practice on his first day of riding. I'm a demanding teacher. 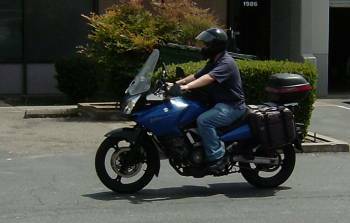 On his first day of riding, Richard was limited to stay within about 250 yards of my shop. He rode his bike 26 miles that day, and got himself a sun burn on the back of his neck. Remember, two-thirds of all motorcycle accidents happen to beginners, people riding for their first year. After a month or two of riding, it's very easy to get over confident and think you've got this skill mastered. Nothing could be further from the truth. You're not over your danger period for at least a full year or 10,000 miles. 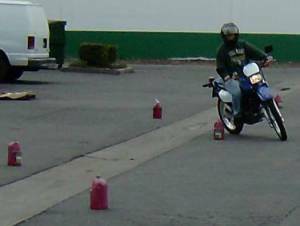 Motorcycles are reasonably safe to ride, but very dangerous to learn. I recommend you take several day long rides, 100 to 300 miles (150 - 500km) in total length. Find some country roads on a map - as noted in Zen and the Art of Motorcycle Maintenance, the very best roads are the little twisty ones that go from nowhere to nowhere. The very worst roads are the dead straight interstates. All of your little bad habits like gripping the bars too hard or slouching will quickly tire you out, and you'll have no choice but to start relaxing and driving with good posture. Don't worry about your bike - modern bikes essentially never get flat tires or break down. An on-coming car turns left in front of you. Car drivers aren't looking to see if anything is coming. They're looking to see if anything really big and scary is coming. Just as a frog never sees things that don't move, most car drivers never see on coming motorcycles. This is the number 1 cause of motorcycle accidents. If you see an on-coming car turn on their turn signal, or get into a turning lane, or inexplicably slow down, it's time for you to pay enough attention for two drivers. A car at an intersection or in a driveway turns right onto the road right in front of you. Same thing as above, car drivers aren't looking for motorcycles, they're looking for trucks. You have to watch for this and make appropriate adjustments. This is the second most frequent cause of motorcycle accidents. You enter a turn too fast, get scared, and run your bike right off the road. Or you enter a turn too fast and hit the brakes too hard, and the bike slides out from under you. The solution to this is to practice. Find some twisty two lane country roads, and ride on them. Ride at a relaxed, comfortable pace for your first couple of months. You have the rest of your life to learn how to demolish the speed limit in corners. 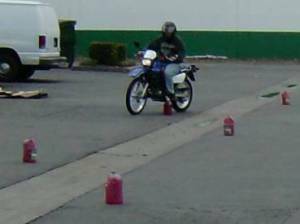 First you have to learn to judge distance and appropriate speed while riding a motorcycle. 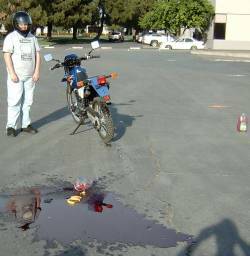 This is the third most common cause of motorcycle accidents - a single vehicle accident caused by misjudging a corner. Finally, beginners and especially teenagers routinely follow too close and wait too long to apply brakes. Sometimes the road has sand or gravel or oil on it. When you hit this stuff in a car, perhaps you'll lock up some tires, or activate your ABS, or perhaps bump into someone. When you hit this stuff on a motorcycle, you're most likely going to lock up your front tire and fall down right in the middle of traffic. Leave plenty of room for slowing and stopping. Many riders will tell you to wear bright orange or red clothing, and to get a device that flashes your headlight. Personally, I disagree with this: I believe that when car drivers see me, they steer for me. It's that "you go where you look" thing. I'd rather be invisible and completely responsible for my own safety. However, I note that most riding instructors will disagree with this and tell you to do everything you can to get the attention of other drivers. You'll have to make your own call on this. One thing on which the MSF instructors and I will readily agree: if your safety program is to hope and believe that car drivers will look out for you, you are going to be a statistic. 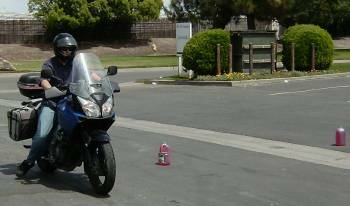 On a motorcycle, defensive and predictive driving is everything.